This time next week, I'll be in the Dominican Republic! While it's finally getting a bit warmer here in New York, I still feel like I've only seen gray, black and brown for the last four months. 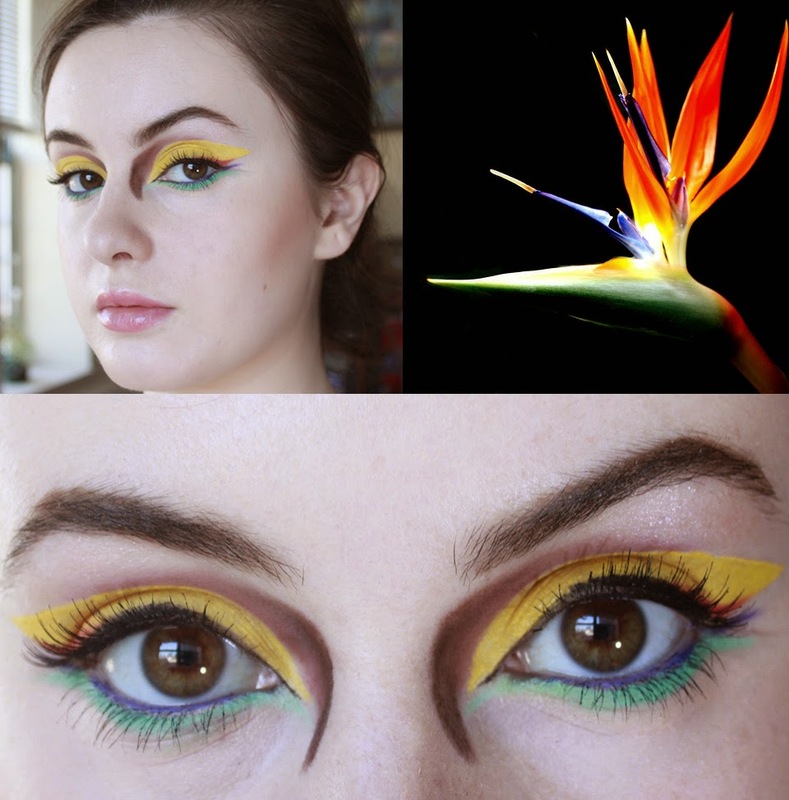 So, to get myself in the warm-weather spirit, I decided to try a very colorful eye makeup look based on the bird of paradise flower. The petals of the plant mimic a series of eyeliner wings so closely (or vise versa!) that I could envision this look right away. I stuck with almost all cream products because they generally offer the most intense color payoff. I found a cream pigment in bright yellow by Ben Nye at Ricky's, and the green and purple liners I already had on hand. I'm not going to do a full tutorial on this look because I can't imagine anyone wanting to adapt this to their daily makeup routine. I'm just going to show you one trick I used which can be a lifesaver if you don't have a very steady hand applying eyeliner. By the way, because of this trip I won't be able to do in-depth tutorials for the next week or two, but I do plan to do a kind of beauty/travel blog post from DR. I'm trying to pack light for this trip, and I want to see how many looks I can create with a few strategically selected products. Should be an adventure! This is a great, cheap (though not super comfortable) trick for dramatic and sharp-as-a-tack cat eyes. Scotch tape! Get a piece under your lower lash line and position at the angle you want. Generally, a good guide is to aim for the end of your eyebrow, but you can make them stand straighter or more flat if you want. Take your time to make sure the other eye's tape is even, and then your work is basically done! 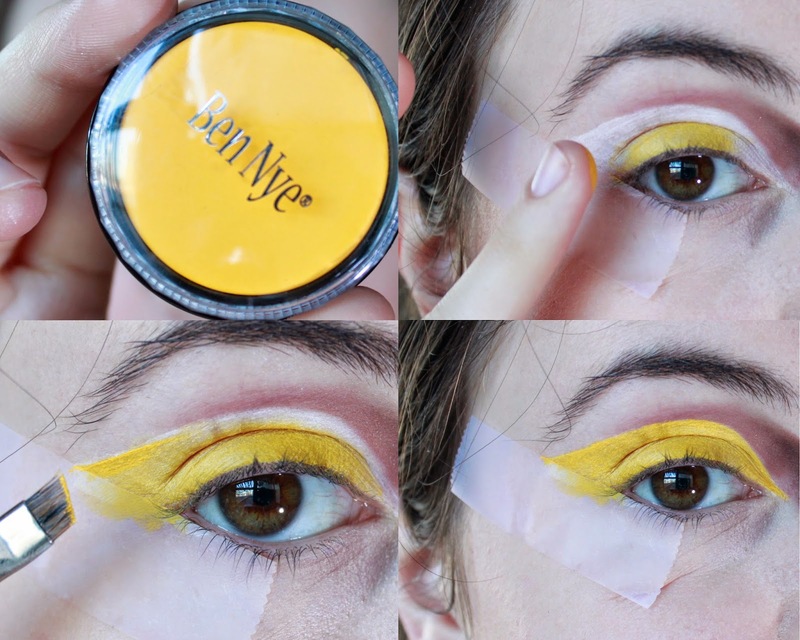 I'm using a white cream liner applied with an angle brush as a base so that my yellow shows up as true as possible, but if you were doing this with black liner you could just go to town from here with it. Gently take away the tape and it's a perfect cat eye. For this, you may want to apply your foundation after you create your eye look because the tape will pull up any makeup you put down before.